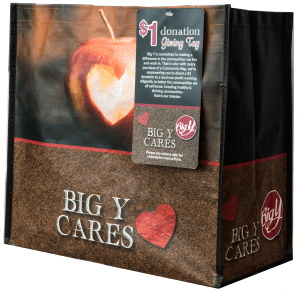 The Big Y Community Bag and Giving Tag Program is designed to make it easy for Big Y customers to contribute to their local community while supporting the environment. The program offers a Community Bag and Giving Tag that support local non-profits in the communities that Big Y serves. Every reusable bag sold results in a $1 donation to a local non-profit. When a shopper purchases the Community Bag featuring the Giving Tag, they are given the opportunity to direct the $1 donation to a local non-profit that is important to them through the Giving Tag. If the shopper does not direct the donation within 7 days, the $1 donation will automatically be directed to the non-profit chosen each month by store leadership at that store location. This program benefits education, civic, health & wellness, hunger relief, and military/veterans organizations that are local to each Big Y location. Please see our FAQs below. If you have any further questions, click here to contact us. What is the Big Y Community Bag? The Big Y Community Bag is a durable, reusable shopping tote that makes it easy for you to contribute to your local community. Every time you purchase one of these specially designed bags, Big Y donates $1 to a local non-profit. Donations from this program support groups focused on education, civic, health & wellness, hunger relief, and military/veterans organizations. What exactly is the Giving Tag? Each Community Bag comes with an attached Giving Tag. Every time you purchase one of these specially designed bags, the store donates $1 to a local non-profit. Shoppers will have the choice to direct the $1 donation to a non-profit of their choice through the Giving Tag within 7 days of purchase. If the $1 donation is not directed by the shopper within 7 days, it will automatically be donated to the non-profit that store leadership at each store location has selected for the month. The Community Bags cost $2.50, with $1 of that purchase price going to support a benefiting non-profit in your community. Big Y is committed to making a difference in the communities in which we live and work. The goal of this program is to make it easy for customers to give back to the community while supporting the environment. Visit our website to learn more about our other community programs. Community Bags are available at all Big Y locations. To find the Big Y nearest you, visit the store locator site. You can also purchase these bags in bulk. The bags make great gifts for friends, family, colleagues, and members of any groups you are involved with because you are giving a gift to them and to the community at the same time. For information on bulk orders, please contact bigy@bags4mycause.com. The bags are available at various registers and at the reusable bag rack. If you are having trouble finding the bag, ask the store manager where the Big Y Community Bag is located and they will be happy to show you! Upon purchasing the Community Bag with the Giving Tag shoppers are directed to visit mybigycause.com within 7 days of their purchase, remove the scratch-off layer to reveal the unique identifier, submit their identifier and select the non-profit they would like to receive a $1 donation. If the donation is not directed within 7 days of purchase, the donation will be sent to the non-profit selected by store leadership at the store you purchased the bag. If you do not see your non-profit listed, you can submit it for approval via mybigycause.com. Once you have submitted the information for the non-profit and it is approved, they will be notified that a donation was directed to them. You will only hear back from us if your non-profit is not approved. What happens to the donation if I do not choose a non-profit? If for any reason you do not choose a non-profit to receive the donation generated by the sale of the Community Bag within 7 days, it will be sent to a local non-profit chosen each month by the store leadership at the Big Y location where the bag was purchased. Every month, leadership at each store location will choose a local non-profit to be the default benefiting non-profit from the Community Bag. The selected non-profits are posted on the reusable bag rack for the duration of their benefiting month. How many non-profits benefit from the Community Bag Program? Every month, Big Y contributes money to approximately 73 non-profits local to the communities in which each Big Y serves. Recipient organizations change monthly based on the selections made by store leadership. Yes, just visit our Community Impact Page to see donation totals broken down by store or by non-profit. When you use the reusable Big Y Community Bags, you show others that you care about the community and also about the environment, because you are not using paper or plastic to carry your groceries home. Yes, Big Y is committed to serving the communities in which we live and work. Submit a non-profit to participate in this program, or visit our website to learn more about our other community programs. When I buy the Community Bag, do I have to do anything else? How will the non-profit get their donation? With each bag you purchase, you have the choice to direct the $1 donation to a non-profit of your choice by following the instructions on the Giving Tag attached to the Community Bag. If you do not otherwise direct your donation through the Giving Tag, the donation will automatically be sent to the local non-profit selected by store leadership at your local store location for that month. You can find out the default non-profit for that month by visiting the reusable bag rack and taking a look at the posted sign. The default monthly beneficiaries will be sent their checks directly 6 weeks after their month ends. Giving Tag beneficiaries who earn more than $10 in a month will also be sent their checks within 6 weeks. Giving Tag beneficiaries who earn less than $10 in a month will be sent their donation checks quarterly.